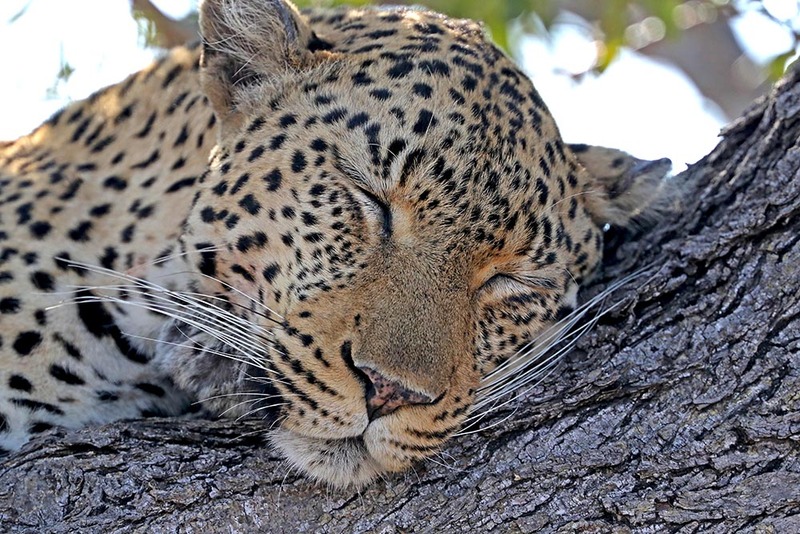 Our safaris take place in rural South Africa on a massive private game reserve who hire the very best rangers and trackers to provide you with exhilarating safaris and position the vehicle for getting those award winning photos while also making sure the sunlight is at your back! Today we travelled a long way on sandy trails through bushes and knocking them over to get a better glimpse of the animals! We came upon a pride of lion including a six month old cub! Suddenly their eyes were focused on something not too far away - "was this lunch"? On this safari we checked off white rhino, Cape buffalo, zebra and elephants. Outside our luxurious cabin we saw a bush buck grazing and when spoken to was not bothered by us and ignored our presence! Time now for our English breakfast in the open diningroom to meet others and talk about our morning sightings. After our scrumptious breakfast it is down time for a shower either inside or out and a nap before once again returning to the dininghall for a homemade buffet luncheon prepared by their own chef! 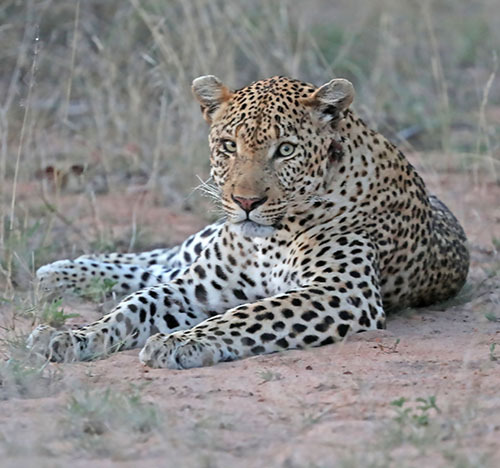 In the afternoon we meet for tea around 3"30 and depart at 4:00 p.m. for another few hours of adrenaline-filled safaris through the expansive territory in hunt for lions, cheetah, leopards, wild dogs, hyena and many birds! Mornings start early here - wake up alarm at 5:00 a.m. and coffee, tea, biscuits and fruit served in the dininghalll where we assemble before going to our safari vehicle. Here we go again through the maze of dirt and hilly roads keeping updates of sightings coming in and were informed of a leopard being spotted so the chase was on! We wasted no time and drove over deep tracks of sand on a dried up riverbed and noticed something moving in the bushes that had spots! There she was! 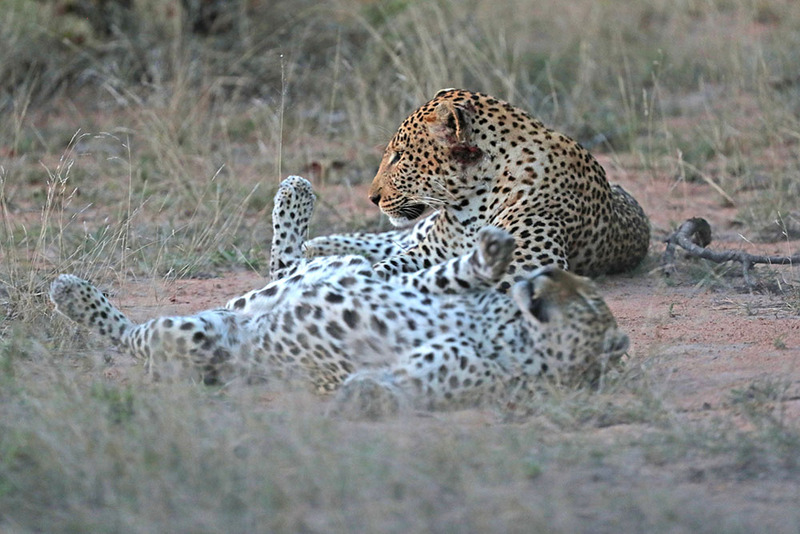 A female leopard trying to corral the male leopard. In the bushes we heard baboons growling at one another that was deafening - a sign that danger was nearby! I have never heard baboons being so loud before but I guess with two leopards within sight who could also climb trees they were putting their signals out! 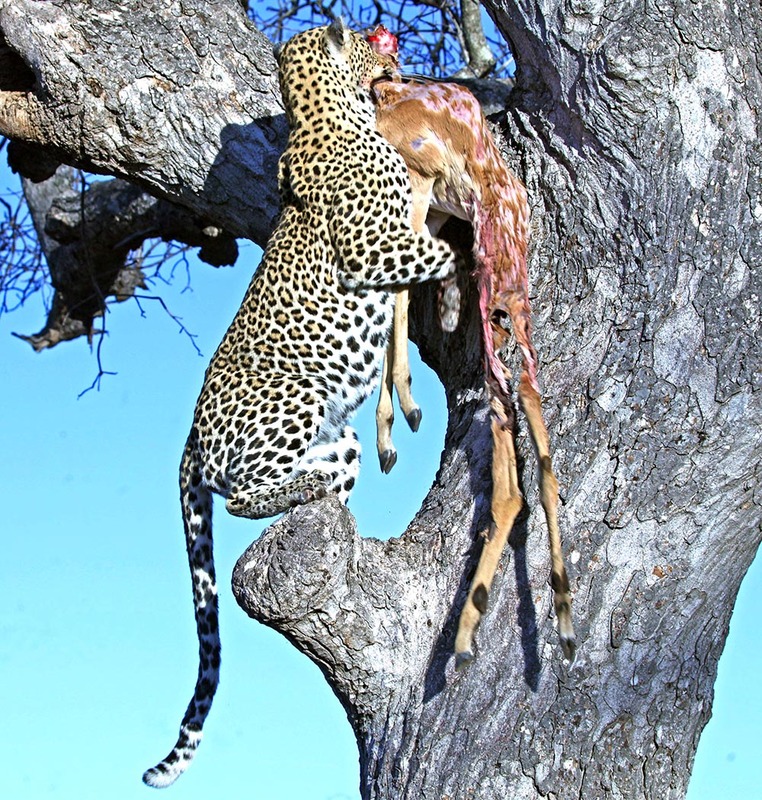 The female leopard was LUCKY! 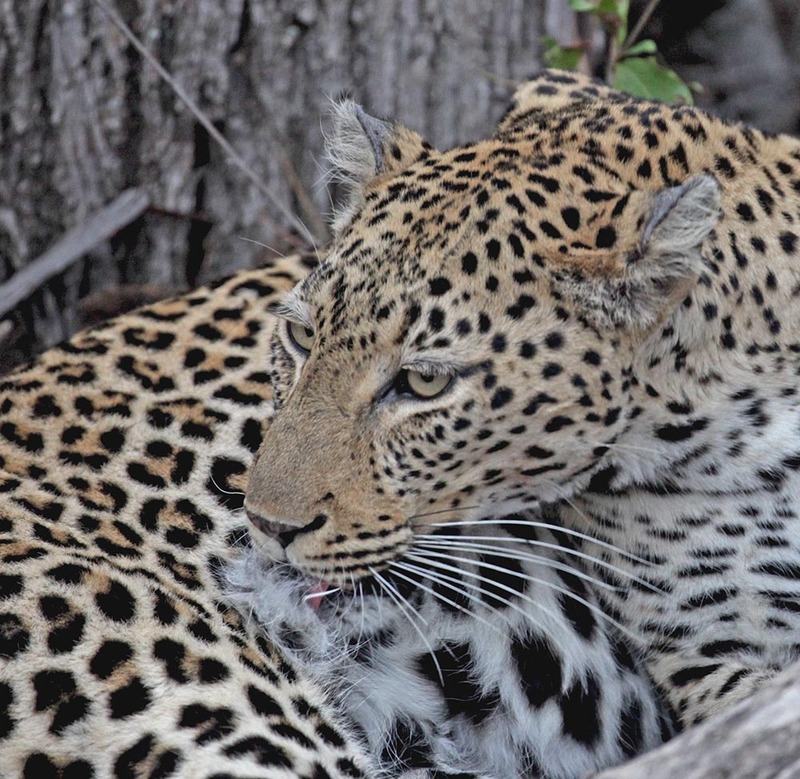 She got him underneath the dininghall and soon we heard the sounds of MATING leopards! Fortunately it was past lunch time and no one above them! Dinner tonight was held in a boma - an outside area surrounding tress lit by candlelight and served a buffet of roasted meats, veggies and salads. Our waiter kept our glasses filled and offered us decadent desserts. What a fun evening meal and sharing our stories with new friends and our ranger! It doesn't get any better than this! Today we heard of two cheetah being in the area but it was a long, bumpy ride to get to the far area of the immense, privately owned property. It was about 10 a.m. and there they were! Walking casually in an open field and our ranger kept positioning the truck so they would walk towards us and being sure that we had the best lighting for photographing! 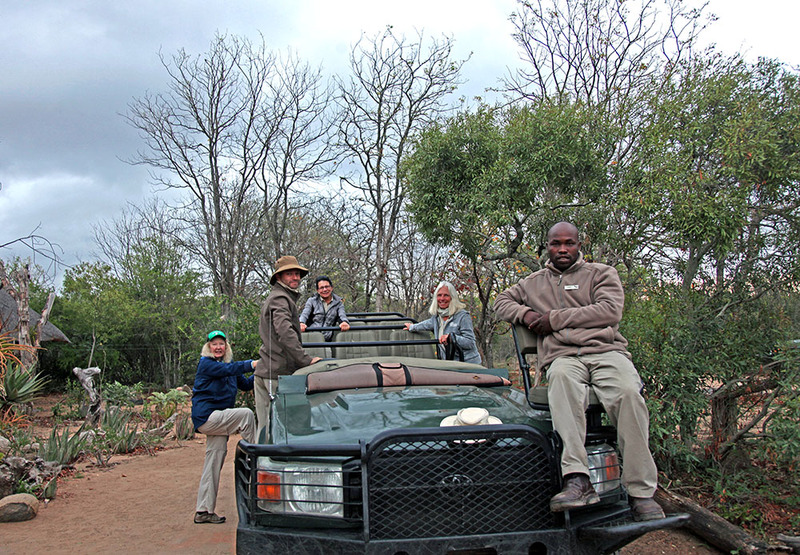 Our ranger's background was in photo-journalism so we felt very honoured to have him as a guide! 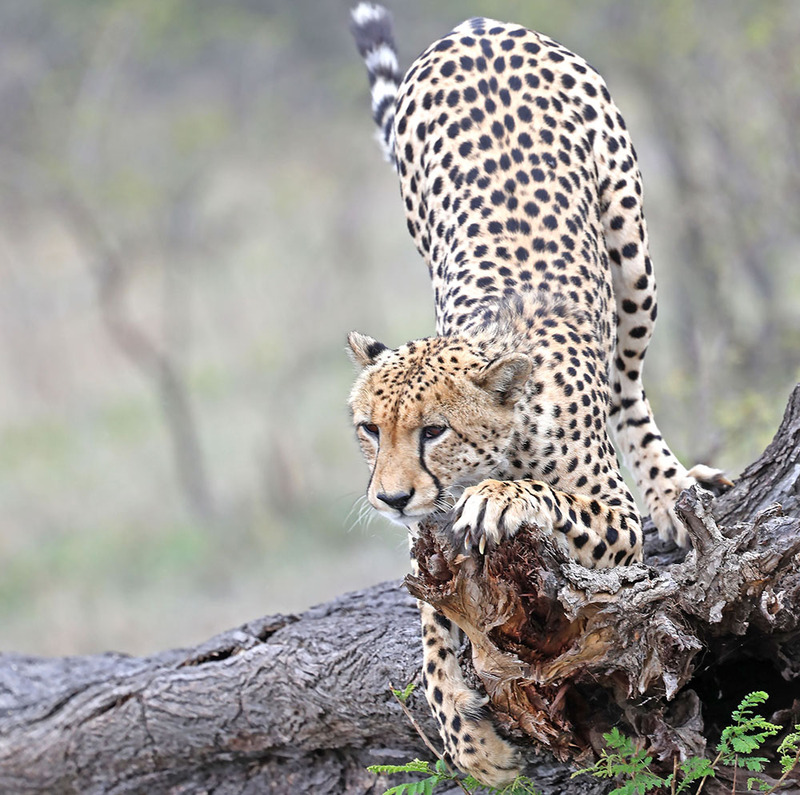 We watched the cheetah for a long time - walking towards us, climbing onto a log, marking their territory and finally resting on a large grassy area! Our excitement continues today in the bushes of SA! No two game drives are the same and our guide takes us down different paths each time to introduce various plants, birds and animals to us. With the radio on and listening to other rangers informing us of their sightings, we travel throughout the massive countryside changing routes accordingly. News that the lions were still in the area we rushed to a waterhole to find them quenching their thirst and lazing about with swollen bellies from their last meal! Also at the waterhole were eight hippos going under water and popping their heads out of water where we anticipated trying to get a photo of their mouths open! As we were leaving the area one of the ladies in our truck hollered "LION"! We quickly turned around and drove through a field, knocking over bushes and being careful not to get scratched by thorn needles. The female lion had just killed a waterbuck - an antelope bigger than our deer. We could see blood all over her face and also too that she was lactating so somewhere nearby she had cubs hidden! Now she was tired and panting from the exertion so we left her to rest. Understanding that vultures, other lions and hyenas quickly move in from smelling the kill we decided to get up even earlier next morning at 4:00 am so we could return to the same location! We returned to the lioness later in the day but she was still relaxing with a full tummy so we decided to huynt down the leopards again! Not an easy task for the ranger as the roads (tracks) are extremely bumpy! The rangers work in teams to track the animals and approach in all directions and finally close in on the sighting! SUCCESS! 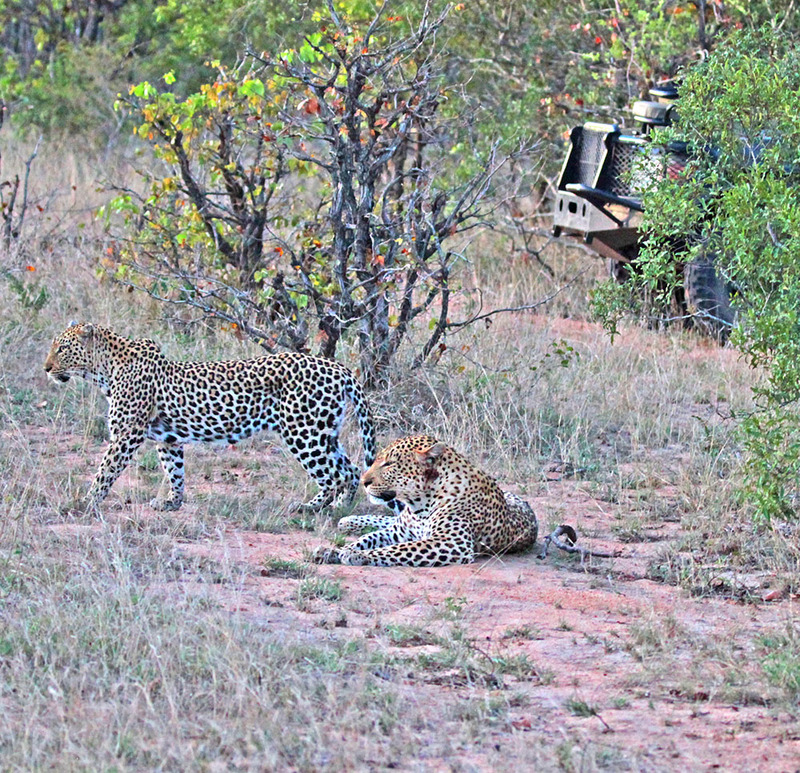 The same pair as a couple of days ago and the female leopard was not giving up as she was very serious about presenting herself for mating session! She was on her back, rolling from side to side and looking his way and for the longest time he was not at all keen on her! As it was getting darker - perhaps the moonlight triggered his desire he gave in and the two disappeared UNDER ANOTHER SAFARI VEHICLE to mate! The ranger of that vehicle told me that he had never experienced that before and could hear the grunting and movement of the vehicle! Better to be in our vehicle!! After this thrilling adventure we were driven into a bush that was all set up with lanterns in the trees, an open bar and our dinner roasting on an open fire! Yes folks - we experienced a real African braii (barbeque) and under a full moon! The excitement just does not end! Our ranger heard that a lion was in the south end of the property but no luck this morning. We stopped for our coffee break in a park like setting amongst some green trees and enjoyed biscuits with coffee, Amarula and hot chocolate. If you mix all three beverages together you have a "Ranger's Special"! Today our tracker informed us of the goodness obtained from various plant leaves. One plant bearing leaves similar to a mint leaf turns into a clear gel similar to aloe when crushed with your fingers and a few drops of water added to it. This would then be used for a shampoo that fights dandruff and can also be used for massages. Elephant dung is not only a wonderful material in building rondovels ( African huts) but also for providing nourishment for dungbeetle egss that the dungbeetles bury in the dung. 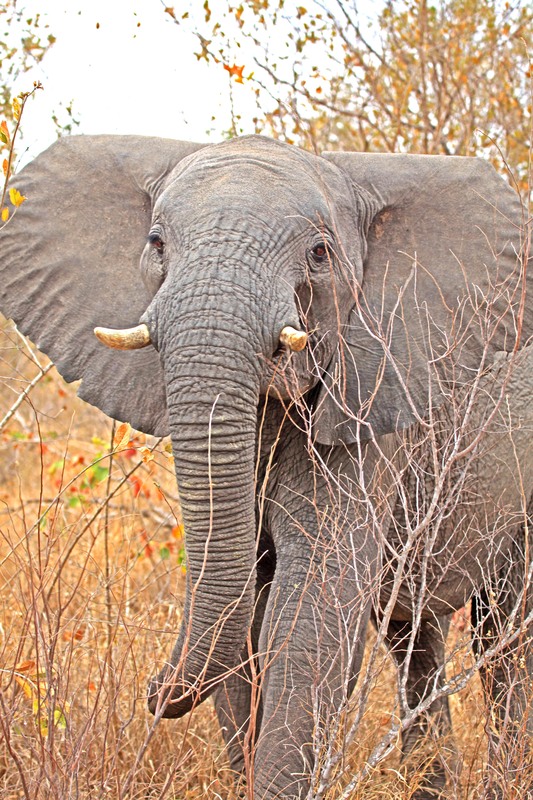 If elephant dung is burned in a room it will kill mosquitoes and if it is inhaled it will cure sinus problems! We saw both male and female dungbeetles moving elephant dung to either bury it to lay their eggs into or forming a shallow hole for the same purpose. Nearing the camp for lunch we saw the usual giraffe, zebra, buffalo and many birds then suddenly a lion appeared! We followed the trail and she crossed right in front of our truck! She was focused on a zebra! The other lions followed her instead of helping her by going behind the zebra closing in on it so it would then move toward the lioness waiting for her! They spoiled it for her and they all decided to relax in a shady area! Close call and right before our eyes! Our afternoon safari was splendid!! We travelled to a waterhole and there before us was a pack of wild dogs having a drink at a waterhole. We watched them in the lowering sun frolic about and followed them into the slender, golden grass into the bush! 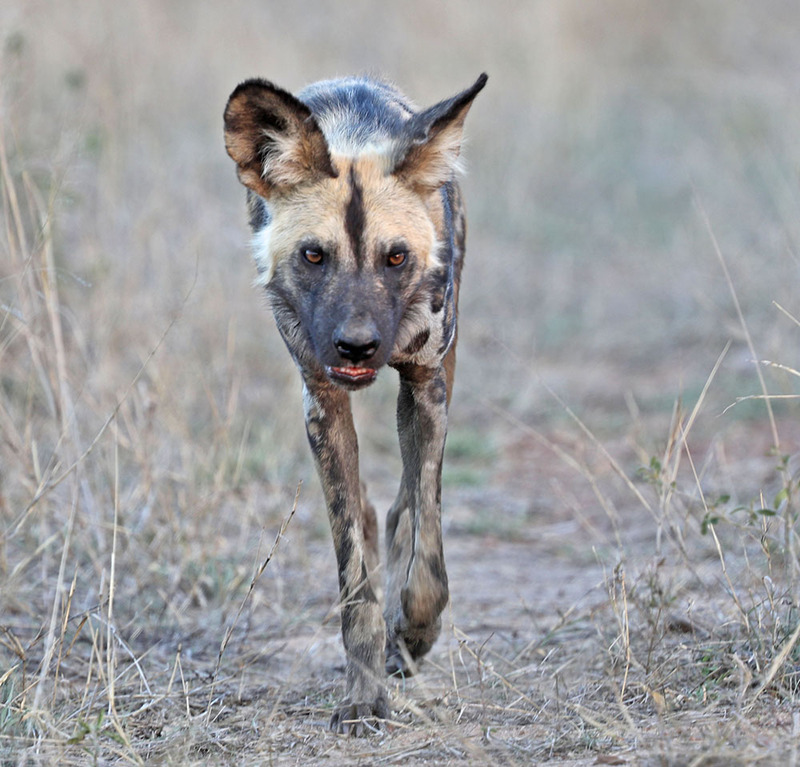 Wild dogs are not seen everywhere in Africa but in this camp they are quite often seen as it has wide open spaces for them to chase their prey, as well as the other predators! Dinner tonight was served in the diningroom with candlelit lanterns hanging from the tree branches and African ladies sang and danced to drums and whistles - a true African performance! A buffet style dinner and drinks of one's choice were served while we chatted with our new friends over the excitement of the safaris we have shared over the past few days! What a wonderful time! Our last safari! Today we saw a herd of Cape buffalo at a watering hole, a couple of rhino wandering in the open field and travelled along another dirt path! 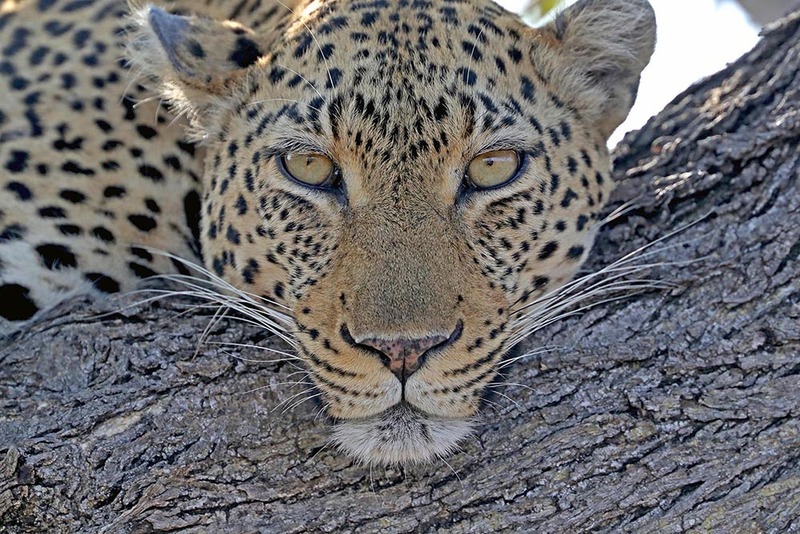 The tracker asked for the binoculars and confirmed his sighting of the male leopard There he was - resting in a mopane tree - likely hiding from the female leopard! Another fantastic photo op for us on our last safari! We enjoyed our last yummy English breakfast and returned to our cabin to pack for our departure! Sadly we must now depart from this wildlife haven and return to our warm welcome at our lodge that is nestled in beautiful gardens in Johannesburg! Liz Taylor would not have had it better than this! 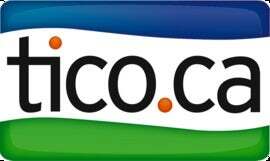 If you are a wildlife photographer and aim for those award winning photographers I can lead you to some fantastic places in South Africa, Botswana and Namibia!